What’s Wrong with the Traditional Display Advertising? Various advertising formats demonstrate not equal efficiency in the B2C and B2B markets since decisions of private and corporate customers are influenced by different factors. While B2C sales are often driven by emotional aspect, prospects in B2B segment need relevant expert information to initiate a purchase. Since transaction price is high, they make decisions thoughtfully and need more time and data to make a deal. 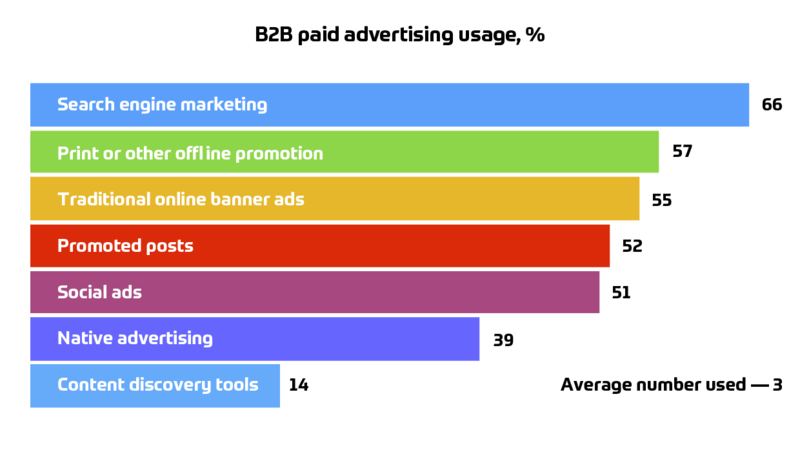 Marketing managers should consider these features when managing advertising campaigns for B2B advertisers. The second reason for poor performance is the insufficient targeting of the audience. When the audience is cold impressions don’t turn into conversions. Campaigns with weak targeting are unwinnable in advance. The B2B audience doesn’t make spontaneous decisions, corporate clients should be led to the purchase gradually with the help of relevant content depending on the funnel stage. As a result, advertisers are disappointed: the spendings are high while ROI is low because they actually pay for impressions to the wrong audience. If you, as an advertising agency or media buyer, want to optimize the performance of your campaigns and gain the competitive advantage you should provide something more effective for your B2B clients. Thus, the solution which will raise the efficiency of B2B advertising is using native advertising and programmatic marketing combined into a modern content marketing platform. Why native advertising? Because it’s considered by potential clients as something useful and credible, containing relevant information and giving objective reasons to make a purchase. The perfect weapon is B2B native advertising adjusted for the specific audience or even for the specific client if we talk about account-based marketing. Creation of high-quality native content requires a lot of time and money, and it should be distributed with the maximum effectiveness to return those costs. Therefore the right content must be shown to the right audience at the right time. The task is simplified greatly by programmatic technology usage. Owing to the sophisticated algorithms that analyze user's profile, performance, interests, and context in a split of a second the prospects get the most suitable content. Now is the best time to employ the synergy of native advertising with the programmatic marketing since the niche of programmatic content distribution is half-empty and the competition is low. 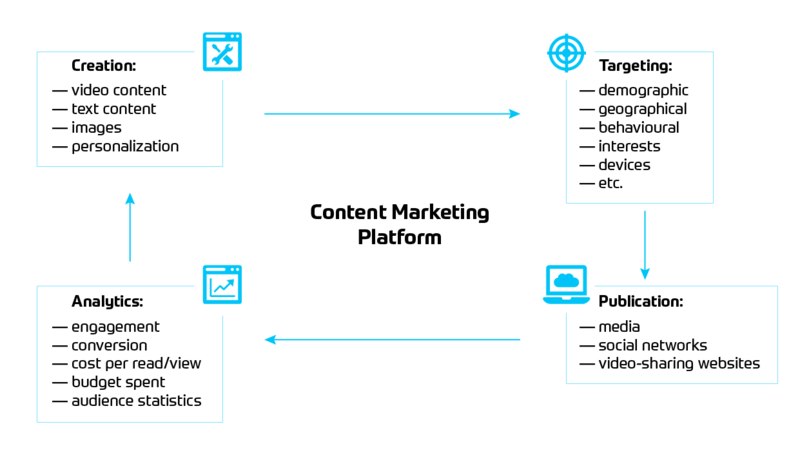 The whole concept is realized in the content marketing platforms for sponsored content distribution based on deep targeting (account-based marketing) and programmatic advertising. Such platforms have ample opportunity for deep targeting and real-time performance optimization. They help to heat prospects step by step leveraging personalized content for every stage of the purchase funnel. A B2B enterprise that acts as a content distributor connects to the content platform and loads personalized text or video content into the admin panel. Usually, the different levels of access can be given to advertisers served via the platform. The platform also allows setting detailed targeting parameters: media, geo, demographic, behavioral, etc. Then, the programmatic technology turns on: when a prospect loads his favorite media site, the platform defines his interests and the buyer journey stage with the machine learning algorithms and shows him an adjusted article or video via the sponsored content widget. Thus, influencers and decision-makers of the key accounts get the right content in the right time. The engagement is much higher, and you pay for the engagement only, since content distribution platform employs the pay-per-engagement model. Except for the top-of-the-funnel content distribution, the platform also provides retargeting instruments. Content engagement is measured accurately at the two levels — buyer persona and key account — directly within the media, and the statistics are gathered in reports that can be sent to integrated automated marketing ecosystems. Moreover, you can optimize active campaigns on the grounds of real-time engagement metrics. Owing to the built-in dynamic RTB technology you pay the lowest price for the most relevant inventories for promoted content. You also can optimize campaigns on the run to achieve the maximum performance and ROI. 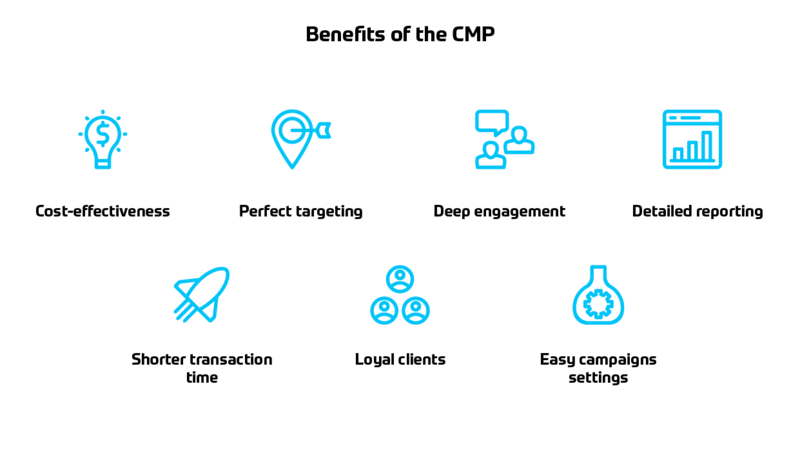 The content distribution platform leverages clients’ data, for example, from internal CRM system, third parties data from attached DMPs, and own data reporting for the deepest targeting. High targeting level provides deep engagement of the audience since appropriate content meets interested potential clients at the right time. Owing to the embedded analytics tools the content marketing platform gathers performance data right in the media. Thus, marketing managers can measure the engagement level and optimize content and targeting parameters. The platform can be integrated with other marketing tools to which you can send the reports on active campaigns. As target accounts and decision makers get necessary information just in time, they need less time to make a deal. Your clients are satisfied with conversion rates and ROI and feel confident and secure because they have access to the campaign's analytics. At the same time, you are the one who sets the level of transparency and defines the level of access. The content marketing platforms have user-friendly interface and many automatization opportunities. It means less manual work, easy campaigns setting, launching, monitoring, and optimization. The Amoniac company builds custom content marketing platforms for purposes of agencies and media buyers. Such platform will widen your advertising tools set and help attract clients working in the B2B market. Leveraging smart content distribution your client will experience individual approach and higher efficiency metrics. 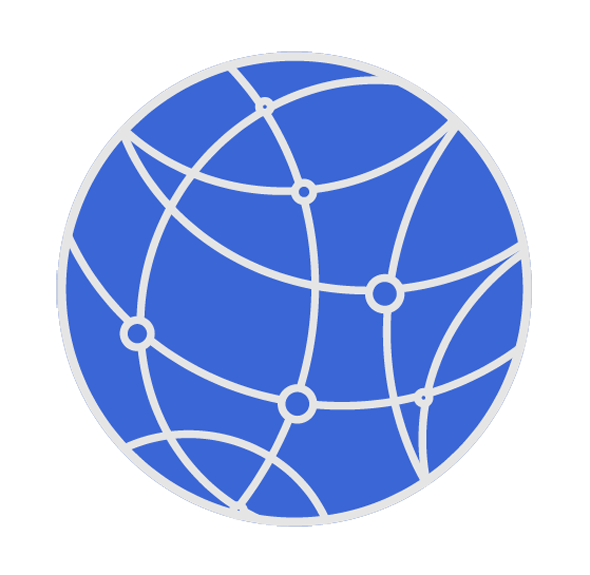 The team of Amoniac developers has deep domain expertise in the field of digital marketing and content distribution owing to the several similar projects delivered. Therefore we can build the platform fast avoiding many difficulties we have faced while developing previous projects. The features set can be adjusted according to your business needs which are above all for us. With such a powerful tool you’ll get the competitive advantages and come to a new level in the B2B advertising. If you need more information on the content distribution platform development, you are welcome to contact us via any convenient method. Content marketing platform is a must-have tool for agencies of all sizes. Leveraging such an instrument, you can provide exclusive service to your clients and receive extra earnings in return. From now on, you're selling no impressions or clicks but readers or viewers involved in clients' content, and they are rightly more expensive. Provide your clients with ample targeting opportunity, access to first-class third-party data, leading ad exchanges, top publishers, and detailed analytics. Adjust campaigns on the move providing the highest return on investment ever.